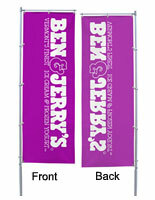 These Flag Banners for TriPole Flagpoles Supply an Excellent Means of Outdoor Advertising! 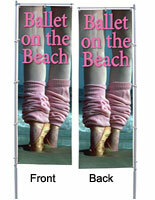 Promotional Signs like these are Enhanced with Hardware (Sold Separately)! 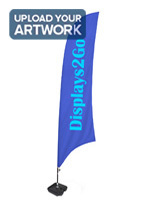 Purchase Feather Flag Banners with Custom Imagery Online For Less! For small quantities, these flag banners are tremendously convenient because they are customized on a large format digital printer. The image is custom printed onto white knitted polyester fabric creating a pennant that is as durable as screen printed options. All of the edges are hemmed to prevent fraying, and a white edge reinforcement is applied to one side and the top to keep the grommets from tearing away from the material. The flag banners are printed only on one side. Depending on the image transcribed, the brightness of the back panels may range from 75-90% of the front image. Dark solid dyes provide the best "through prints." The reverse side of each of the flag banners has a mirrored image of the graphic printed onto the front. 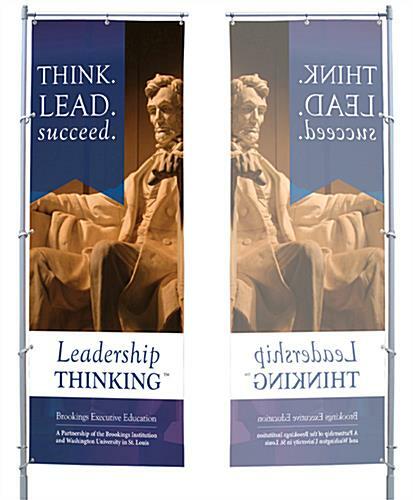 For larger quantities, we suggest silk-screened displays for better through prints at lower costs.